A Mass of Christian Burial, April 22, 11:00 a.m., Holy Redeemer Church, Vanderbilt. 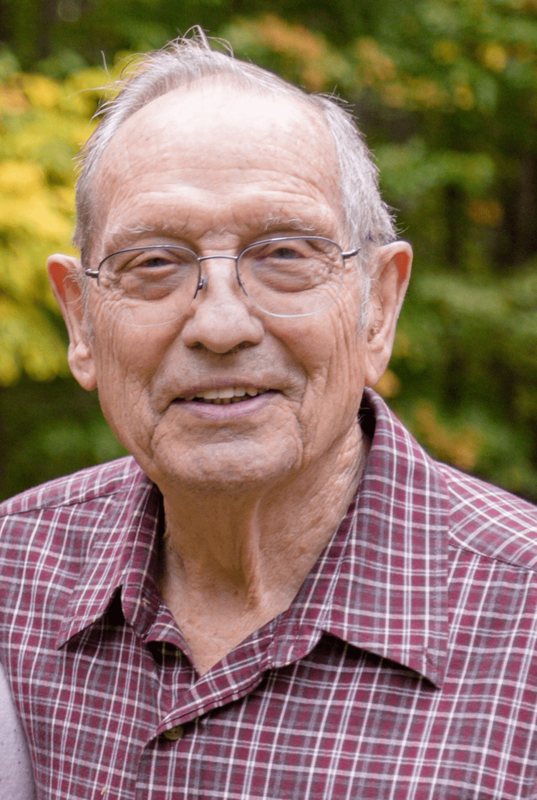 Visitation, 9:00 a.m.
Thomas E. Douglas, 90, passed away peacefully amid a large family gathering on April 11, 2019, at Otsego Memorial Hospital. In October 2018, he celebrated seventy years of marriage to his soul mate, Geneva (Avery) Douglas. Before graduating from Grayling High School in 1947, Tom helped his family run the Douglas Hotel and other businesses in Lovells, Michigan. After high school, he completed a two-year dental-technician program at a university in Elkhart, Indiana, and then operated Douglas Dental Lab for fifty years, first in Grayling and then in Traverse City. In 2003, Tom and Geneva built a house near Vanderbilt, Michigan which they shared until just recently. He was devoted to sending all his children to Catholic schools, and to supporting Geneva in starting her businesses, Old Town Kid Stuff in Traverse City and Alpine Kid Stuff in Gaylord. Tom is survived by his wife, Geneva (Avery) Douglas; seven children, the “Douglas Dynasty”, Sylvia (Tom) Zamoyski, Thomas M. (Karen) Douglas, Stephen (Deborah) Douglas, Yvonne (James) Jipping, Theresa Douglas, Jerry Douglas, Mary (Sean) Burns; eighteen grandchildren; Shannon (Kirk) Yodzevicis, Shelly Zamoyski, John (Shazy) Zamoyski, Jessica (Jason) Fontenot, Brian Douglas, Kristen (Brian) Struebing, James (Sarah) Douglas, Kate (Chris) Walski, Robert (Heather) Douglas, Meg (Eric) Jones, Johanna (James) Willis, Aaron Crawfis, Rachel Crawfis, Thomas (“T.J.”) Douglas, Jenie Cooper, Killian Burns, Teagan Burns, and Aidan Burns; and twenty-two great-grandchildren. Tom was preceded in death by his infant sons, James and John Douglas; grandson Jeffery Zamoyski; father Thomas (“Edgar”) Douglas, mother Beulah (Collen) Moore; brother James Douglas, and aunt, Margaret Douglas. A memorial service will be held at Holy Redeemer Catholic Church in Vanderbilt on Monday, April 22, 2019. Visitation will run from 9:00 a.m., to a Mass of Christian Burial at 11:00 a.m., followed by a church luncheon. In lieu of flowers, the family suggests contributions to the St. Mary Cathedral School of Gaylord. Theresa I will not be able to attend your fathers service. I’m so sorry. You all will be in my thoughts & prayers. Wow….what a legend. Sounds like a very accomplished gentleman…you all should be so proud and you must have some great memories!!!! Hang on to those and each other…love to all! Rest in the arms Angels…So many memories remain with your loved ones and forever in their hearts. Sending prayers to all. Geneva, I want you to know you are in my prayers. Deepest sympathy to the entire family.